You are in the middle of winter, walking down the street, but still warm despite the cold weather. Snow boots, woollen socks and a coat that might as well be worn by an eskimo might help quite a lot keeping you warm. And when at home, the lovely heating is there to welcome you. Sadly, not all of us are that lucky. Homelessfonts is an initiative promoted by the Arrels Foundation, from Barcelona (Spain). Their aim is to create new fonts from the calligraphy of homeless people from Barcelona. But these are definitely not like the others. 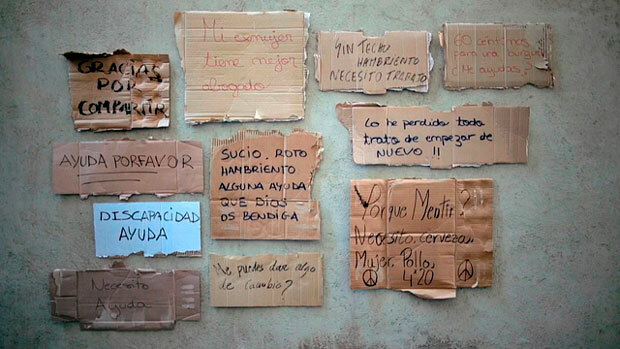 The homeless received calligraphy workshops and practiced with typographic exercises, to create their own font. This is how their letters were digitalized and fonts created. These are fonts that have a soul and a story and that will carry with them the feelings and identity of their creators. Any designer, business or individual can buy these fonts to use in their designs, posters, branding, etc. And with every purchase, you will help tackle homelessness. Homelessfonts is just one of the projects of the Arrels Foundation. Among their other projects, they have also launched a campaign for Christmas where they had homeless people create and send Christmas Cards to raise awareness about the problem of homelessness and how hard it is to spend Christmas on the streets. With the fund generated the Foundation was able to provide dinner and shelter for them during Christmas. Projects like these are just another proof of the transformational power of arts and culture. Thanks to these, Arrels is able to aid 1,800 people every year.